Each morning there is a meeting of the launch crew on the fantail, which is aft, which means the back deck of the boat. You need to wear your hard hat and your PFD which stands for Personal Flotation Device. It is really great that the life-jacket is embedded into the jacket. Wednesday I went out on a launch, a 28 foot boat, and attempted to collect hydrographic data. However, the weather did not cooperate. We were tossed around by winds of 30 knots, which is approximately 34.5 mph, and 5 foot swells and waves. I found out that swells are large scale rollers of water and waves are choppy. Swells have more amplitude, a lot of energy, are larger, and are driven by far off (can be thousands of nautical miles away) weather storms or very high or low pressure systems. Waves are surface wind driven, choppy, smaller, and have more pitch. You can have either one by itself or you can have both together, either going the same direction or cross-ways. Well, we had both swells and waves from different directions at the same time! The waves had whitecaps and the swells were just big! I couldn’t even get out my camera to take a picture because I was holding on to the rail in the cabin with both hands, trying not to fall or get in the way of the scientists as we pitched about. And, can you believe, no seasickness! We were called back to the ship after the current we measured registered at 5 to 5.5 knots, much too fast for us to put our CTD (Conductivity, Temperature, and Depth) into the water. The professionals aboard the Fairweather put a premium on safety and knew it was time to call an inclement weather day and have the launches return. By the way, the picture at the left was taken on another day. How quickly the weather can change! Today, it was wisely decided that I would be exposed to the science on the ship while the launches went out and the weather system finished passing through. I was able to learn from Mark Bradley who is a hydrographic survey technician. Some days he goes on the launches and uses the multi-beam echo sounder to map sections of the seafloor. 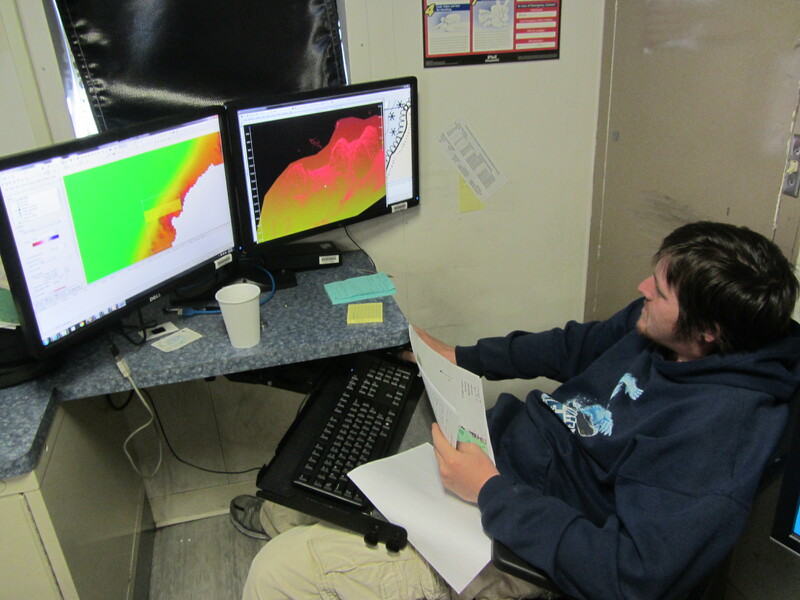 Other times he works on the ship processing the data that has been collected and preparing the descriptive report. Today he was comparing old charts to the new survey soundings that a launch had previously recorded while they were picking up holidays during a low tide. Remember, holidays are where there are gaps in the data. While resurveying this holiday they saw a rock sticking out of the water so they came back later in the day during high tide and used the multi-beam sonar to get a depth measurement for the top of it. Mark then took this data and compared it to the old charts. The old charts didn’t even have this rock recorded! He used his 3D imaging and measured the rock at 83 meters wide and 30 meters tall. It was huge! At low tide, it stuck a meter out of the water. This rock was in navigational water and easily could have damaged or sunk a boat. Mark confirmed another nearby rock was 3 feet under the surface so if you were in a boat you wouldn’t see it. This second rock was a known rock; however, on the old chart it was at 42 feet below the surface, not 3 feet! So there is a great need to update our navigational charts since the old ones can be over 100 years old. Eventually, this chart he’s updating will be revised and published by NOAA Charting Division. 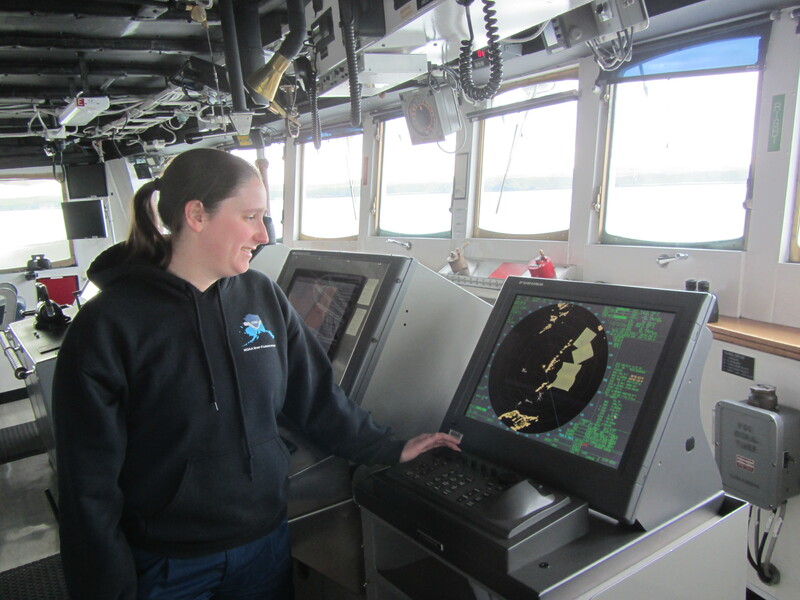 Today I would like you to meet Kristin Golmon, a Junior Officer for NOAA who is currently aboard the Fairweather. This Texan is a woman who is in charge! She is an ODD which stands for Officer of the Deck. Because the CO, the Commanding Officer cannot be on the bridge (the space that you command the ship from) all the time, an OOD directs the bridge when he is below, and is the direct representative of the CO. She drives the ship, does survey work, does administrative duties and currently she’s also working towards her coxswain qualification. 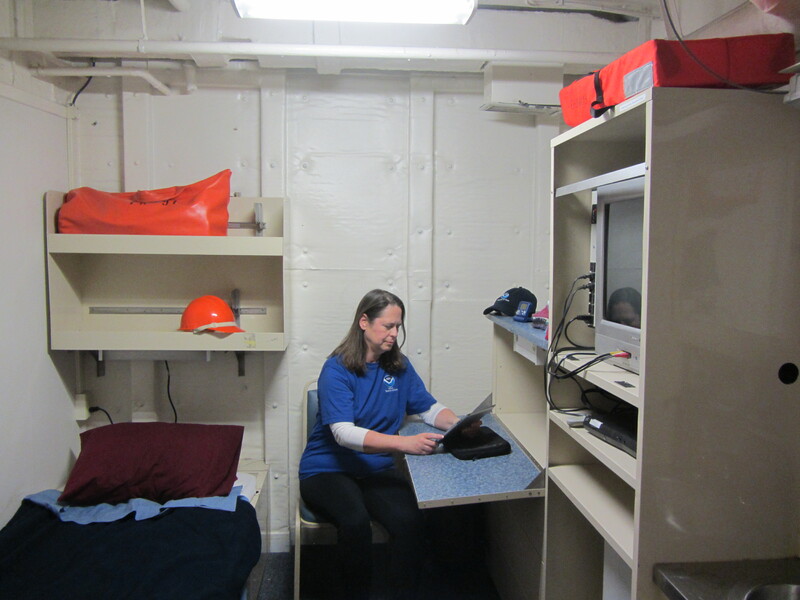 Today she is in charge of the bridge, working on charts, communicating with the hydrographic survey launches, and recording the weather. Kristin has always been curious about how stuff works. In elementary school she invented a t-shirt folding machine out of cardboard. You would put a t-shirt on it and it would fold the shirt and you would pull the cardboard out! She always did well in math and science and had her parents, a geologist mom and a mathematician dad, as her role models. She attended Trinity University in San Antonio, Texas and earned a BS in Engineering Science, a minor in Mathematics and another minor in Environmental Studies. She was a senior in college when she heard about NOAA Corps and liked their science mission. She also liked the idea of serving her country in a uniformed service. 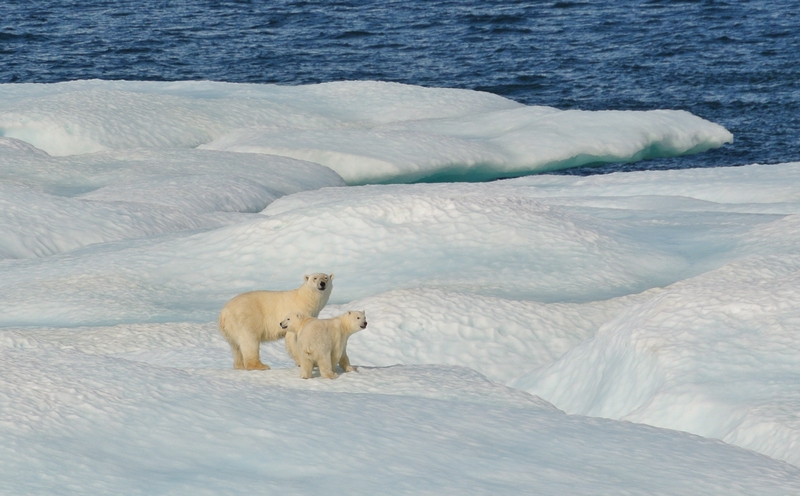 Polar bear mom and her two cubs, Artic Ocean, 2012. Photo courtesy of Casey Marwine. Being a woman in charge has its challenges when working in a male dominated field but she has the respect of her peers and the CO. Currently, the head of NOAA is Dr. Kathryn Sullivan, a geologist and an astronaut who was the first American woman to walk in space. 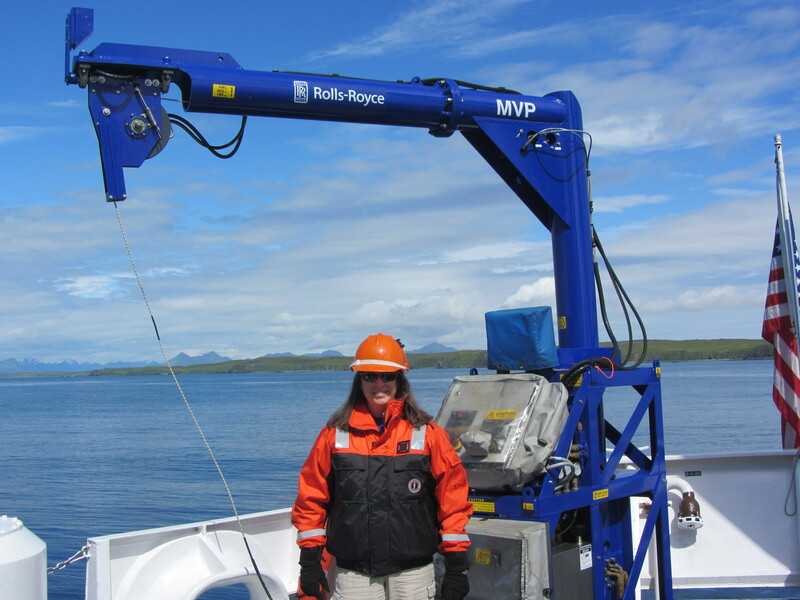 When asked what she liked best about her job, Kristin said that it’s a pretty cool experience being in charge of a ship, especially when going through narrow passages that take a lot of planning like the Inside Passage in Alaska. She also loved seeing polar bears, a mom and two cubs, while doing the Arctic Reconnaissance Survey! Check out where I live on the ship. This is my room, or as we call it aboard ship, my stateroom. Notice the hard hat and survival suit above the bed and the life jacket above the television! I also have a desk that folds up when I don’t need it. It was a treat to have my own room. The shower and the head (what they call the bathroom) is across from my room. Also on the ceiling of the hallway outside my bedroom is an escape hatch! 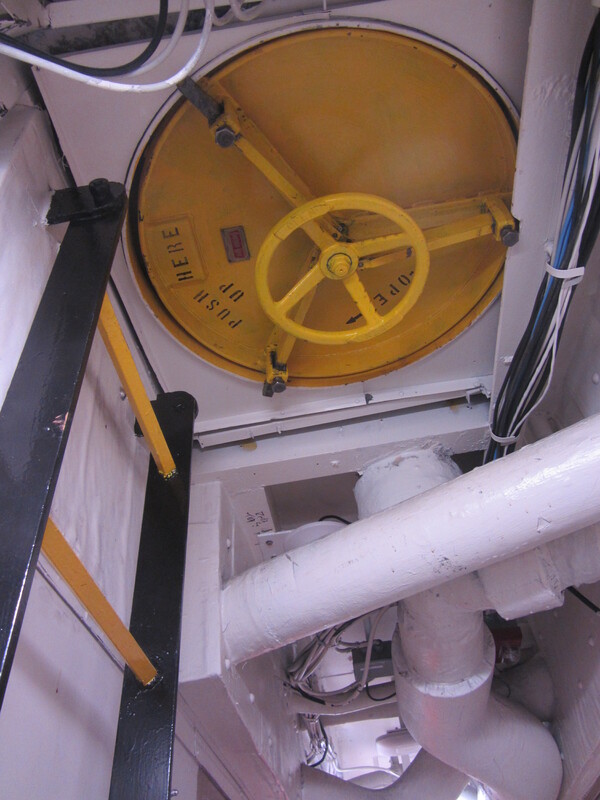 Then in the floor above is another hatch. This way I can safely get up to the upper decks if my hallway gets blocked or flooded. Question (or Answers): Today’s question will actually be answers! And speaking of polar bears, remember my question from my first blog when I asked you the question of what were the odds that I would see a polar bear? Well, the answer is none. The polar bears are much farther north and are found in the Artic region of Alaska, Canada, Greenland, and Russia. Unfortunately, I will not be seeing any polar bears. My poll last blog asked you to identify a picture as plant or animal. Many of you voted and it was a pretty split vote between the two! The picture is of bull kelp, a plant, and its scientific name is nereocystis. It can grow huge and I have seen some big ones here in Alaskan waters. 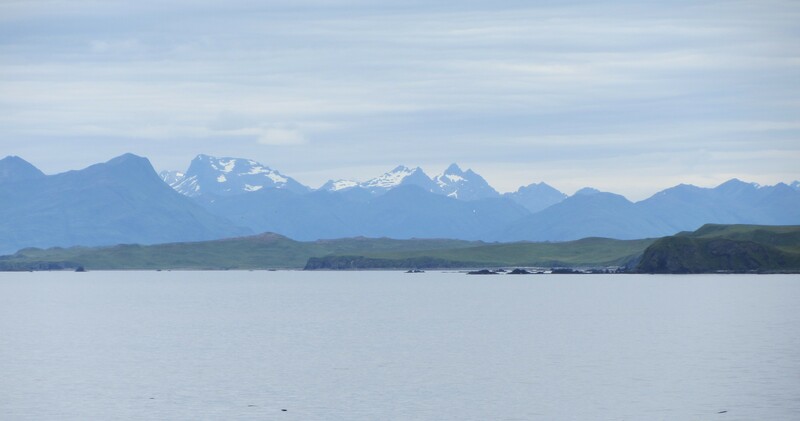 I will leave you with this shot of beautiful Kodiak, Alaska that I took from the ship. This is where we are anchored this week. This entry was posted in 2014, Dana Clark, NOAA Ocean Service, NOAA Teacher at Sea and tagged Alaska, CTD, Dana Clark, Fairweather, Hydrographic survey, NOAA Ship Fairweather, polar bear. Bookmark the permalink.